Recently I purchased a few young goat hearts from Sherrie, owner of Cracked an Egg Farm. I had them in the freezer and today I decided to make this dish. It was inspired by a beef tongue dish that I ate several times when I was in Panama years ago. 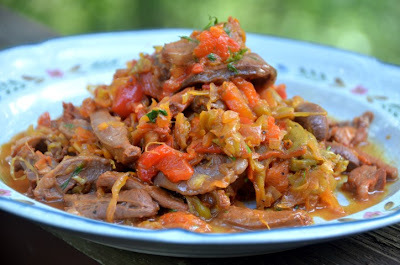 I have made a similar dish a few times in the past using beef tongue and they were as delicious as I had remembered. If you do not have access to goat hearts you can use tongue instead. The young goat hearts are very tender. This dish is served with rice. Thank you Sherrie for the tasty hearts!! 1) Heat oil in a medium size pan over medium high heat. 2) Once the pan is hot, add onion and garlic. Saute for about 1 minute. 3) Add the goat hearts, saute for about 2 minutes. 4) Add peppers, sauerkraut and Sazón seasoning. Saute for about 2-3 minutes. 5) Add black pepper and cilantro and turn off heat. *Sazón (Goya) con culantro y achiote packages do contain monosodium glutamate (MSG) which can trigger headaches in some people. You can substitute with a tablespoon of chicken powder instead. For color you can add annatto. This is sold in the spice aisle or in ethnic food markets.